About Us : PepperTraders.com, West Texas Pepper Traders, Inc.
Our idea of a Bread and Butter Jalapeno was started in the summer of 1995 when Scott Bridges and I got our heads together and started experimenting in the kitchen. Both of us being die hard "Chili Heads," we were looking for different ways to prepare jalapeno peppers because Scott had planted several hundred pepper plants in his home garden and had a "bumper" crop; therefore, we needed ideas on what to do with these peppers. Since Scott and I both liked Bread and Butter Pickles and loved jalapenos, it seemed like a natural mix. After several less-than-appetizing batches, we came up with what is very close to the recipe and process we use today. We started making 10 to 20 pound batches once or twice a month in our kitchens and canning them in Mason jars, giving them to our friends and family. This work went on for about 4 years and by that time, the demand for our Bread and Butter Jalapenos was so great that we were spending our entire weekends making batches of peppers for distribution the following week. It was then that I told Scott that we might have something and should look into starting a company. Scott and I both felt like we had a great product, but neither of us had any experience with the food industry. However,we were determined to learn all we could as fast as we could, so we started our research. We knew we had a unique product from the start and the more we looked, the more we realized how truly unique and "Original" our product was. Our next step was to find a place where we could make our new product. We found out very quickly that it would cost much more than either of us had to start our own kitchen, but the good lord was looking out for us and led us in the right direction. One Saturday afternoon Scott and I were out checking local stores for any competition we might be up against when we ran across Tony Dry, who was handing out samples of his award winning Billy Beans I "Scream" Sauce at a local HEB store. We told Tony about our product and that we were looking for a facility to help us produce it. That is when we first learned about Disability Resources, Inc. (www.driabilene.org). He told us about how they provided a loving and caring environment for a truly special group of folks. We were both very excited about the opportunity to work with such a wonderful organization. The folks at Disability Resources, Inc. are given the chance to be a productive member of society in spite of their disabilities. These folks produce national award-winning products that they can point out to their family and friends at the grocery store and proudly say "I made that." The following week we met with Buzzy Andress, the Director of Vocational Services at DRI. Buzzy gave us a tour of the entire facility, which was only a few months old. Scott and I were amazed at how we had both been here in Abilene all these years, and neither of us had ever known anything about this organization. We both knew that we had found the perfect home for our product and that we would always want to be a part of DRI. Now that we knew where our product would be made, we formed the company and were incorporated on April 1, 1999. We started working with Buzzy to expand our small batch recipe and keep the quality we had in our home kitchens. We introduced our second product, The Original Bread 'N' Butter Marinade in January 2001. 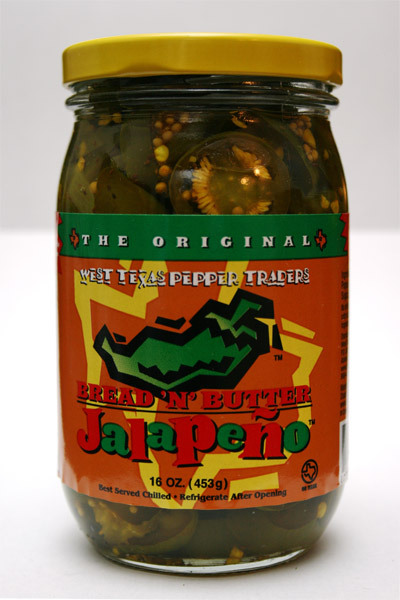 The only ingredient in this product is the juice from our Original Bread 'N' Butter Jalapeno. We had been pouring this excess juice from our pepper batches down the drain for the entire first year. It wasn't until a customer told us how he used the leftover juice from his pepper jar to marinate his chicken. We entered it in the Chili pepper Magazine's National Fiery Food Challenge and took 3rd place in a category of over 125 other marinades. Not bad for a byproduct. Today our production calls for over 4 tons of fresh jalapeno peppers per month and our Original Bread 'N' Butter Jalapeno can be found in over 1000 grocery stores, gourmet and specialty shops, and restaurants all over the country. We strive to maintain a reputation of taste, freshness, and quality in every product we make using only premium ingredients that are precisely measured and blended to insure the best product possible.